Ripping out an old ceramic tile floor that's in good condition can be a challenge. When tiles are in good shape, but a color that's no longer working for the rest of the room, it can be a tough call to make. Luckily, although it will take a bit of work, it is possible to paint over the current ceramic tiles and seal them to be waterproof once more. This enables homeowners to update a floor without the invasive renovations that a new floor would entail. A new color floor can radically change a room's look. Remove everything from the floor, including appliances and furniture. Clean the floor well. Sweep or vacuum to remove debris and mop it with a ceramic floor cleaner to remove any substances that can inhibit the bond between the floor and the paint. Use an angled paintbrush to carefully cut in the paint on the edges of the tiles. Avoid getting the paint on the grout for the best look. After cutting in the edges, brush the paint across the center of the tile in careful strokes. Move the brush in one direction only to avoid unnecessary brush strokes on the floor. Let the floor dry completely. Mop the floor with a urethane floor sealer to seal in the paint and provide a protective waterproof layer to the tiles. Update the color of the grout to coordinate with the new color of the ceramic tiles, using grout paint. Use an artist's paintbrush and carefully apply the grout paint to the joints between the ceramic tiles. 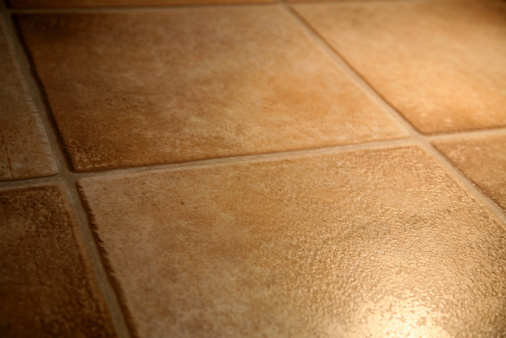 Grout paint contains a sealing agent so there is no need to seal your new grout color.